↑ "Incumbent Odesa Mayor Trukhanov declared winner in Sunday mayoral election". interfax.com.ua. ↑ "Who's Behind A String Of Bombings In Ukraine's Black Sea 'Pearl'?". NPR. 2015. สืบค้นเมื่อ 7 July 2016. ↑ Tell about Ukraine. Odessa Oblast. 24 Kanal (YouTube). Ghervas, Stella (2008). "Odessa et les confins de l'Europe: un éclairage historique". In Ghervas, Stella; Rosset, François. Lieux d'Europe. Mythes et limites. Paris: Editions de la Maison des sciences de l'homme. ISBN 978-2-7351-1182-4. Herlihy, Patricia (1987). 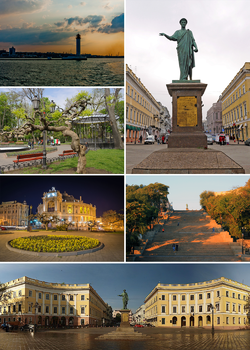 Odessa: A History, 1794–1914. Cambridge, MA: Harvard University Press. ISBN 0-916458-15-6 (hardcover), ISBN 0-916458-43-1 (1991 paperback reprint). Herlihy, Patricia; Gubar, Oleg (2008). "The Persuasive Power of the Odessa Myth". In Czaplicka, John; Gelazis, Nida; Ruble, Blair A. Cities after the Fall of Communism: Reshaping Cultural Landscapes and European Identity. Woodrow Wilson Center Press and Johns Hopkins University Press. ISBN 978-0-8018-9191-5. Richardson, Tanya (2008). Kaleidoscopic Odessa: History and Place in Contemporary Ukraine. University of Toronto Press. ISBN 0-8020-9563-1. สืบค้นเมื่อ 7 November 2009. Tanny, Jarrod (2011). City of Rogues and Schnorrers: Russia’s Jews and the Myth of Old Odessa. Bloomington, IN: Indiana University Press. ISBN 978-0-253-35646-8 (hardcover); ISBN 978-0-253-22328-9 (paperback). Zipperstein, Steven J. (1991) . The Jews of Odessa: A Cultural History, 1794–1881. Palo Alto: Stanford University Press. ISBN 0-8047-1251-4 (hardcover), ISBN 0-8047-1962-4 (paperback reprint). "People wash Odessa. The clip was made to the 218th city day by Alexandr Milov". หน้านี้แก้ไขล่าสุดเมื่อวันที่ 15 กุมภาพันธ์ 2561 เวลา 04:40 น.